Using a workshop model, while reading and discussing literature as a whole class, in small groups, between partner pairs, and through individual reading responses, students apply higher level thinking skills such as analysis, synthesis, and evaluation. Students write in their Writer’s Notebook daily, using the writing process to produce final pieces in the genres of memoir, persuasive essay, historical fiction, poetry, and fantasy. Students engage in regular spelling, vocabulary, and grammar studies, and apply these skills to their writing. 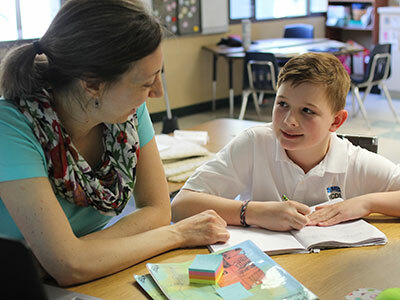 Topics covered this year in the Singapore Math program include numbers to one million, factors and multiples, fractions, parallel and perpendicular lines, area and perimeter, computation and use of decimals, volume of solids, and extensive practice with multi-step word problems. As a part of the Singapore curriculum, students develop an in-depth understanding of these math concepts and give special attention to the reasoning and process of solving mathematical problems. Students in fourth grade practice analyzing data to formulate conclusions to experiments. Students analyze the interaction of human joints and muscles to create movement. They measure how the human pulse, respiration rates and temperature are affected by exercise, and then extrapolate this information and relate it to all mammals. A comparison of series and parallel circuits enables students to discover the appropriate applications of each. Lab safety and basic equipment becomes imperative as they study the transfer of heat in solids, liquids, and gasses. Fourth graders experiment with the water cycle and the power of water in nature. Students study map skills, American history (from the colonies through the first seven Presidents), and ancient African kingdoms. Many of our units build upon one another, allowing students to identify cause and effect and to see how historical events are related to one another. Students increase their background knowledge through reading and discussing our textbook as well as other outside sources. They engage in a range of projects that aid in understanding and application from planning a road trip, to interviewing a president, to creating a PowerPoint comparing and contrasting the five African kingdoms. The goal of the Spanish program is to grow in communicative competence. Fourth grade curriculum continues to build vocabulary and further develop sentence construction and verb conjugation. Topics include body parts and expressing pain, numbers, clothing, describing appearance and personality, describing the inside and outside of a house, chores, table settings and food, morning and evening activities, and occupations. Throughout the year, students discover various cultures and regions of the Spanish-speaking world. Fourth grade uses the book “Viva el Español – Qué Tal”. Students begin a broad introduction to the Romantic era and American Jazz in music history, styles and forms of music, by studying composers and listening to many musical examples. Students work from the Associated Board of the Royal Schools of Music Grade 1 Theory workbook and put theory concepts to practical use during weekly partner piano lessons. Once weekly choir class offers students the opportunity to analyze music pieces, practice sight-singing and aural skills, and learn how to read from choral scores. Students prepare for twice yearly piano recitals, twice yearly choir/orchestra concerts, and the optional graded examinations of the Associated Board of the Royal Schools of Music, London. Students can choose to continue their string playing in fourth grade to explore new sounds and skills. Students learn approaches to design and figure drawing and make independent drawings from graphics and sight observation. The year includes a section on art history as students study M.C. Escher and optical art, Japanese art, and Gothic cathedrals. Topics and activities coordinate with other class subjects, particularly history and geography. Students participate in a Faith Ringgold quilt-making study along with a self portrait. The program emphasizes physical skills that can be applied in multiple sports situations. Through games and drills, students learn basic skill development, fine and gross motor movements, spatial awareness and basic strategy. Students develop confidence and motivation to participate in organized and individual physical activities while learning leadership, teamwork and good sportsmanship, all of which encourage lifelong fitness.